Thanks for taking us on an amazing 14 day ride that I will never forget. Every day there was something fantastic to see and the riding around the mountains was so much fun. The food was great and some of the places we lunched at had the greatest views to enjoy while resting. The Minks are a fantastic bike to ride that should not be underestimated. 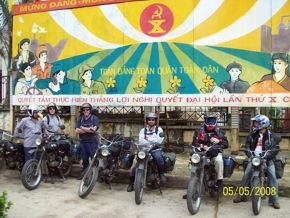 The friendly nature of the Vietnamese people is unique. The organisation was just superb, from the first meeting at the hotel to the farewell dinner. Thanks for a great time and I look forward to going on another ride with you guys.